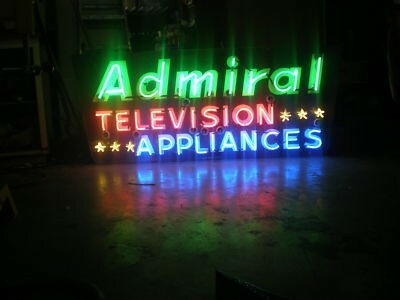 This large neon for Admiral Television Appliances was made with simply three lines of text. The top line reads “Admiral” and is written in green. The middle line reads “Television” and is written in red. The bottom line reads “Appliances” and is written in blue. To the right of “Television” and the left of “Appliances” are three stars each.